Tried and true, the original 38mm wastegate by tial. These wastegates have been used in turbo setups for years and have been tried and tested successfully by many people. 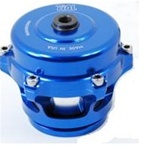 When purchasing a Tial product, make sure to purchase from a reputable seller, like us as manufacturers in China have been cloning these specific wastegates for some time now. From the naked eye side to side, original vs clone are difficult to differnetiate. We only sell genuine Tial products and for 4cyl setups making under 400whp we recommend the Tial 38mm wastegate. 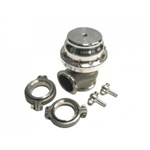 We also carry for Tial 38mm vband wastegate. For custom setups or for setups where space is limited the vband application is a better choice. Choose your color Silver, Red, Blue, Purple, Black and your spring pressure .6 or 1 bar. A great alteration to the original, successful 38mm Tial wastegate. The new Tial 38mm vband has several improvements over its successful predecessor. There are 5 ports on this wastegate, three around the center for the "side" port. If you have ever had a setup where the vac line placement was not ideal or difficult to service you could see how beneficial having a choice on where you place the port is! There are two "top" ports for the wastegate as well. Included in the kit you get 3 plugs and 2 banjo assemblies suitable to your configuration. If you are planning on running a divided setup on your vehicle two of these wastegates can be used on setups up through ~800whp. 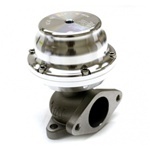 For exceptional boost control on high power applications, the tial 44mm wastegate is your choice! We only sell genuine Tial products and for 4cyl setups making upwards of 750whp we recommend the Tial 44mm wastegate. We have used these wastegates on our street turbo kits for years making anywhere between 500-715whp without fail. The large valve diameter allows for great boost control at low boost even with large setups with very little backpressure. We have had no issue controlling boost ~40psi with one of these single wastegates in several applications. Choose your color Silver, Red, Blue, Purple, Black and your spring pressure .6 or .9 bar. This blow off valve is the original Tial valve. Up until recently this was the only valve from tial. We have never had issues with these valves on our cars and prefer to use them over the competitions valves. Not only is the valve it self superior but the clamping system. With each valve assembly comes a pre notched flanged in your choice of either steel of aluminum with a vband clamp for endless rotation orientations as well as an oring for a no-leak seal. These valves come in several colors and a few spring pressures, we list the colors here for options, if you have specific requests please contact us directly via email - Sales@ForceFedEngineering.com for any color/spring combination you may need. Please choose the material in which your charge pipes will be fabricated from, aluminum or steel. The Tial 60mm wastegate is a good option for turbo system utilizing very low backpressure setups for large engines (6cyl) or for a single wastegate on a divided 4cly/6cyl manifold. Choose your color Silver, Red, Blue, Purple, Black. Please also choose a spring pressure. This recirculating blow off valve from tial is great for applications where a mass air flow (MAF) sensor is being utilized. 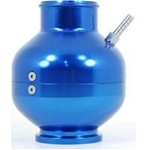 The valve does not vent to open atmosphere like the other valves offered, it recirculates the charge air to the inlet for a system where all incoming air is metered and taken into account. 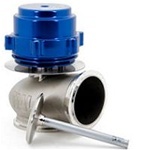 This blow off valve is a revised version of the original valve. Besides its stylish good looks its outlet ports are designed to optimize the release pressurized air up to 60% more than the original valve! This is the highest flowing BOV on the market. The Q bolts right up to any standard TiAL flange so you can upgrade without having to re-weld a seperate flange.